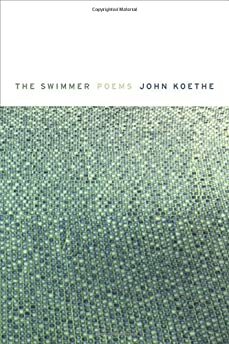 Largehearted Boy: Book Notes - John Koethe "The Swimmer"
Book Notes - John Koethe "The Swimmer"
John Koethe's tenth collection of poetry, The Swimmer, finds him ruminating on the topic of death in straightforward yet thought-provoking verse. "...I find myself deeply seduced by Koethe's bald existential terror; I feel companioned. And I'm interested in a mind that can formulate such fathomless thoughts so plainly. These poems won't shatter the universe, but that's precisely their point, the tragedy they lament: that as individuals we are small and the universe pays our seemingly vast inner lives no mind. Koethe seeks to ease his mounting fear by talking—by writing—himself through it, and listening in is a perverse pleasure, and a palpable comfort." I didn't realize how much music is referred or alluded to in my new book The Swimmer until I was asked to write about it, but there is. I'll try to say something about what it's doing in the poems in which it appears. "Frank Sinatra's Trains": The epigraph, "Let's fly away," is from the title track of Sinatra's album Come Fly with Me, which is referred to at the beginning of the poem, along with Sinatra at the Sands, perhaps his definitive live performance, where's he's backed by Count Basie. I mention Neil Young as another musician who collects model trains, and someone else whose name escaped me at the time but whom my girlfriend subsequently reminded me is the singer Rod Stewart. Bobby Darin crops up in the second stanza---if you want to hear him at his most Sinatraesque, try Live at the Copa---and I allude to his Vegas hipster version of "Up the Lazy River" at the beginning of the third stanza. I go on to mention two other "exotic" songs from Come Fly with Me that have always haunted me: "On the Road to Mandalay," which is based on a Rudyard Kipling poem, and "Brazil." Apparently Terry Gilliam found the latter haunting too---I read somewhere that he said the inspiration for his movie Brazil came from seeing (or was it imagining?) an old man sitting on a deserted beach listening to the song on a tinny transistor radio. "Von Freeman": The poem is about jazz, but it starts with some childhood memories of rock and roll in the mid-fifties: Elvis Presley singing "Hound Dog" on the Ed Sullivan Show in 1956, where they cut off his image below the waist because his gyrations were considered obscene; Fats Domino's "Blueberry Hill," my favorite song at the time; and Tennessee Ernie Ford's "Sixteen Tons," which wasn't rock and roll at all, though I associate the song with it because it was popular when I was first listening to rock. But as I said, the poem is about jazz and was prompted by my discovery of the great Chicago saxophonist Von Freeman, whom I'd never heard of until I read his obituary in 2012: he refused to travel and play outside of Chicago and consequently was largely unknown beyond it. The poem is a litany of a lot of my favorite artists, some of them obscure, like Spike Robinson, a saxophonist from (I think) Kenosha I heard at a local jazz club, but most of them famous, like Paul Desmond, Frank Morgan, John Coltrane, Chet Baker, Bill Evans and Mal Waldron. The last line is an homage to and near quotation from Frank O'Hara's elegy for Billie Holiday "The Day Lady Died," which ends in the Five Spot in New York where "she whispered a song along the keyboard/to Mal Waldron and everyone and I stopped breathing." "The Japanese Aesthetic": "Time After Time" by Von Freeman shows up again, but followed by an allusion to the Willie Nelson classic "Funny How Time Slips Away," the best version of which I've ever heard is the rhythm and blues one by Junior Parker, who runs into an old flame while out walking his dog. As for musical delivery, Leben is a small Japanese maker of tubed stereo components that are especially musical and natural. "Little Guys Who Live Here": The poem is about cats of course, but I quote a witticism at the end about T.S. Eliot that depends on the fact that the musical Cats is based on his book Old Possum's Book of Practical Cats. As I indicate in the poem, I encountered it in a New Yorker cartoon, though I've also seen it attributed to the playwright John Guare. "Melancholy of the Autumn Garden": The poem is a kind of elegy for the painter and gardener Robert Dash, though it was written shortly before he died, after my last visit to Madoo, his garden in Sagaponack, New York, in 2012. I don't remember how we wound up talking about the singer Mabel Mercer, but we did, and I quote from her version of the song Bart Howard wrote for her fiftieth birthday, "All in All It Was Worth It!" "Dorothy Dean": The poem is a memory poem about a woman I met at a party in New York in 1972, and whose name I kept coming across thereafter. One of the places I heard it was on Lou Reed's live album Take No Prisoners, in a long version of "Walk on the Wild Side" that covers the song in a perfunctory fashion, but which is mostly a monologue on the circumstances of its composition. His reference to Dean as "Tiny Malice" is an allusion to Edward Albee's largely forgotten 1965 drama Tiny Alice. "Idiot Wind": The title is that of one of my favorite Bob Dylan songs, from his album Blood on the Tracks. The song has nothing to do with the poem (apart from supplying its title), which was provoked by one of those dreary periodic "poetry is dead" pieces I read a few years ago. "Chappaquiddick": The poem is a meditation on recent (and not so recent) American history, and the talk in the first section of towers to the sun and trains that raced against time is an allusion to "Yip" Harburg's Depression-era dirge "Brother, Can You Spare a Dime?" The classic version of that song is Bing Crosby's. "E.H": The poem is mostly spoken by Ernest Hemingway, and the epigraph is from the song "Losing My Mind" from Stephen Sondheim's musical Follies. I was reading a book called Hemingway's Boat (in which he's always referred to as E.H.) about the same time I saw the revival of Follies on Broadway a few years ago, and it struck me that as he declined Hemingway and Sondheim's character Sally Durant were both pathetic in similar yet very different ways, and I decided to incorporate them into a poem. "Losing My Mind" is a heartbreaking song and a real showstopper. In the revival I saw Bernadette Peters did it in a subdued and beautiful manner, but the definitive version is still Barbara Cook's on the original cast album, where she pulls out all the stops. "Fear and Trembling": I graduated from high school in San Diego in the spring of 1963, and a few years ago attended my fiftieth reunion, where of course they were playing the songs of the day, just before the Beatles broke in the fall. I don't recall too many specific songs, but I'll let Lesley Gore's "It's My Party" stand for them all. Cut her hands off right above the wrists. Give her a birthday kiss. Linger on . . .